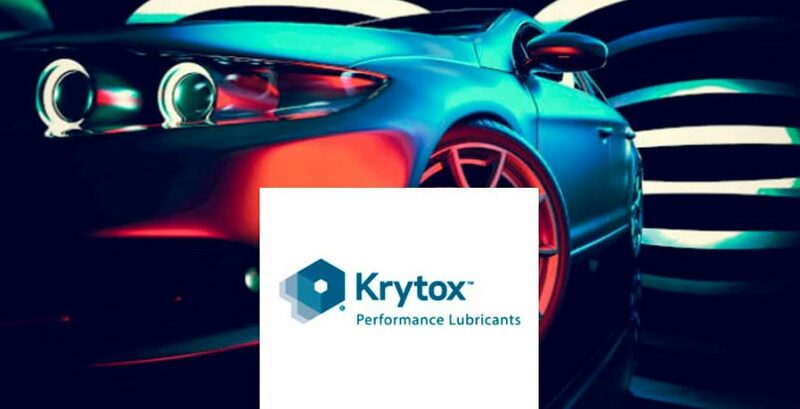 Krytox performance lubricants for automotive have helped customers outpace the competition by bringing customized and innovative solutions into an increasingly competitive automotive industry. Whatever your engineering challenge longer part life, extreme temperatures, reduced failures Krytox performance lubricants can help. We put our science to work to produce lubricants that can stand up under the extremely demanding conditions of today’s engineering design standards. Krytox performance lubricants offer a wide range of high quality, high performance lubricants to address the most challenging and complex requirements of original equipment manufacturers (OEMs) and world-class Tier One suppliers. Our family of oils, greases, and coatings will provide long-term operational excellence and high performance lubrication in extreme operating conditions. 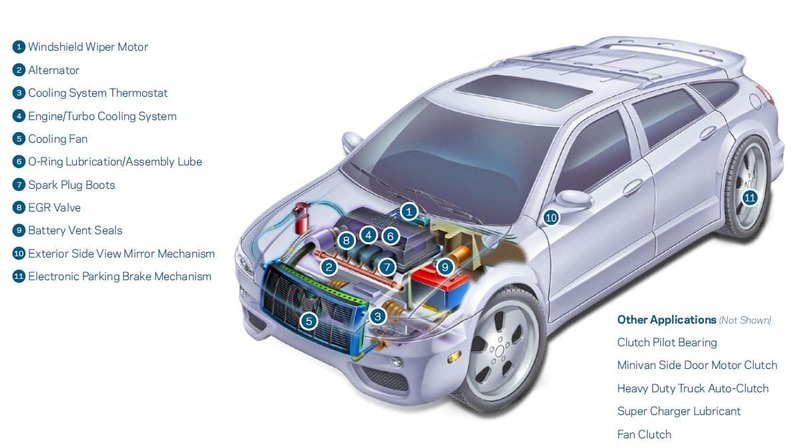 Automotive design engineers have learned that specifying Krytox lubricants during the design phase can provide OEMs with significant cost savings. By lengthening the life of critical components and improving consumer satisfaction, Krytox lubricants help reduce repair costs and potentially save millions in warranty claims. Automakers are striving for extended warranties, expecting longer intervals between vehicle service visits and very limited relubrication operations. Krytox lubricants have provided state-of-the art performance for mechanical systems, such as gearboxes, bearings, chains, seals, actuators, valves, and other components. Krytox lubricants don’t oxidize; they provide excellent lubricity and a high viscosity index through a broad range of viscosity grades. Most applications where Krytox lubricants are specified are considered by OEMs to be lubricated for the expected lifetime of the vehicle. Krytox oils and greases are based on perfluoropolyether (PFPE) oils, with a full range of viscosities available. These synthetic fluorinated lubricants are effective from -75 °C to greater than 400 °C (-103 to >752 °F), depending upon operating conditions and product grade. Krytox products are fully synthetic—not petroleum-based—and totally inert, so Krytox oils and greases do not react with anything in the environment. Unlike other lubricants, at temperatures under 350 ºC (662 °F), Krytox oil does not oxidize or break down into other substances that could be harmful. Krytox lubricants do not contain any volatile organic compounds (VOCs), according to the U.S. EPA definition. Our full fluorinated lubricants are made of fluorine, oxygen, and carbon only. Krytox products have a very long service life. This means that products do not have to be replaced and disposed of frequently, which reduces waste. Because the Krytox molecule stays intact, the oils can be recycled if they become contaminated. The recycled products can then be returned to the customer for reuse. 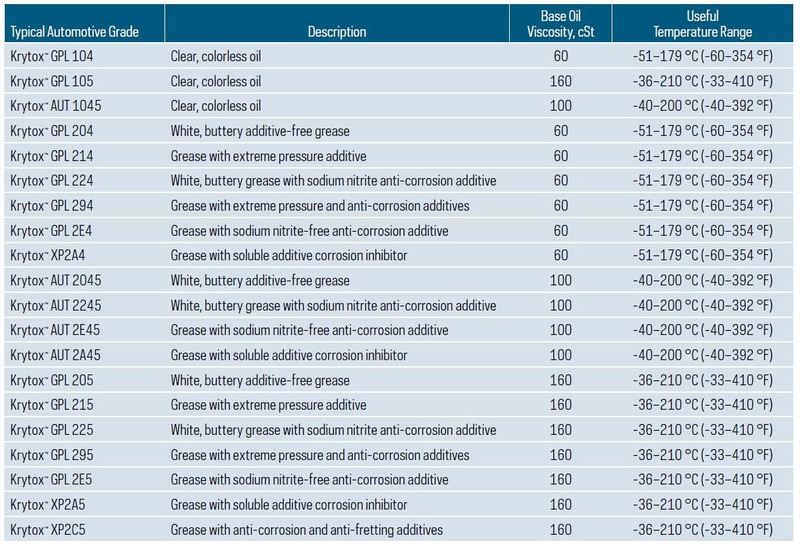 Krytox oils and greases are not considered hazardous wastes as manufactured under the U.S. EPA Resource and Recovery Conservation Act guidelines. However, treatment, storage, transportation, recycling, and disposal of these products must be in accordance with applicable federal, state/provincial, and local regulations. Protection of the environment and people is a core value of Chemours. Our sustainability goals go beyond traditional footprint reduction to include goals that tie our business growth to the development of safer and environmentally improved new products and sustainable solutions. Krytox lubricants provide longer lasting lubrication, which lowers the frequency of relubrication; therefore, reducing the use of materials and reducing waste important steps in helping to reduce product impact on the environment. Krytox greases typically last 5-50 times longer than standard greases. One common bearing test that demonstrates the extreme performance of various grades of Krytox grease is the ASTM D-3336 test method, where heating/cooling test cycles are continued until failure or the completion of a specified number of hours of running time. Test results have shown that Krytox greases can continue to perform beyond thousands of hours and at temperatures beyond the range specified for most applications even outlasting the tester itself. Because of their low surface tensions, Krytox oils and greases easily lubricate metallic surfaces. Krytox lubricants are chemically inert and, therefore, have no adverse effect on metals when the temperature is below 288 °C (550 ºF). 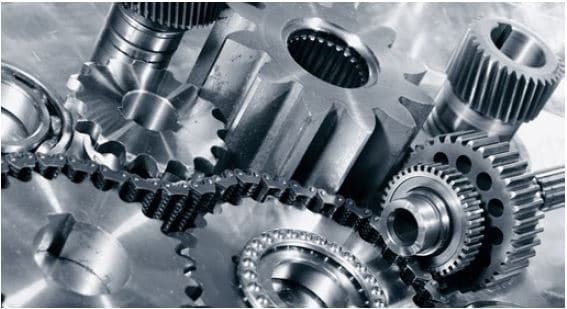 Above this point, Krytox lubricants will be the best-in-class choice for many alloy steels, stainless steels, titanium alloy, nickel alloy, and cobalt alloy. Krytox oils are good insulators due to fundamental properties. Our synthetic fluorinated lubricants are chemically inert, insoluble in most common solvents, and nonflammable. Krytox lubricants are not sensitive to aggressive weather conditions, such as rain, snow, ice, dust, or grit, and they are extremely resistant to the harsh underhood chemical environment of fuel, coolant, brake fluid, engine oil, and washer solvent. 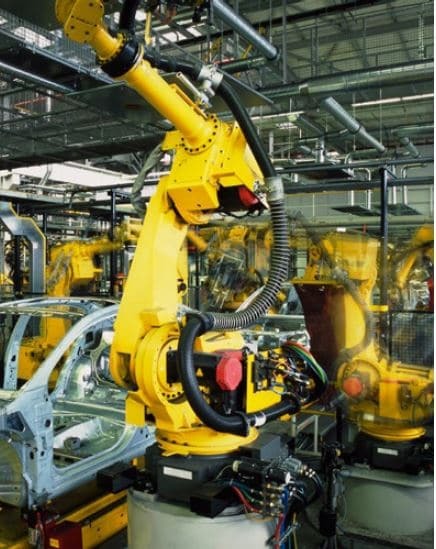 Krytox lubricants provide OEMs with significant cost savings when specified for use during the design phase. By lengthening the life of critical components, Krytox lubricants reduce repair costs and potentially save millions in warranty claims. 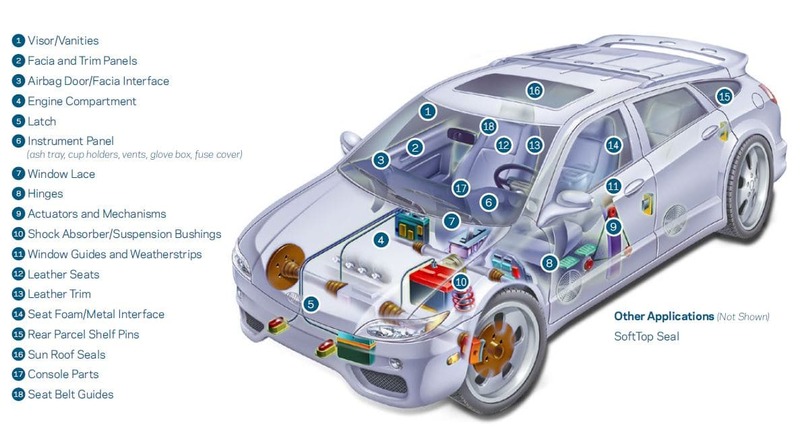 Within an automobile’s interior, there are several places where different materials contact each other. Some examples include metal on plastic, leather on leather, and weather-stripping. Movement between these surfaces often results in a series of noise described as squeak, itch, or judder. Krytox lubricants can permanently eliminate these noises. They are easy to apply, have low volatility, and can remain in place over the vehicle’s entire lifetime. Furthermore, Krytox oils and greases are compatible with a wide variety of materials, and have the frictional and long-life characteristics that make them ideal lubricants in these applications. A thermostatically controlled fan clutch typically drives the cooling fan. The bearings that support the drive shaft for this clutch regularly experience high temperatures. If these bearings wear and begin to fail, the cooling fan runs less efficiently. When this occurs, the engine can overheat, and any resistance in fan clutch rotation can drain valuable power from the engine’s drive shaft, further reducing overall performance. Krytox lubricants have low volatility and a high viscosity index, providing long-life and excellent lubrication to the fan clutch bearing under these high temperature conditions. 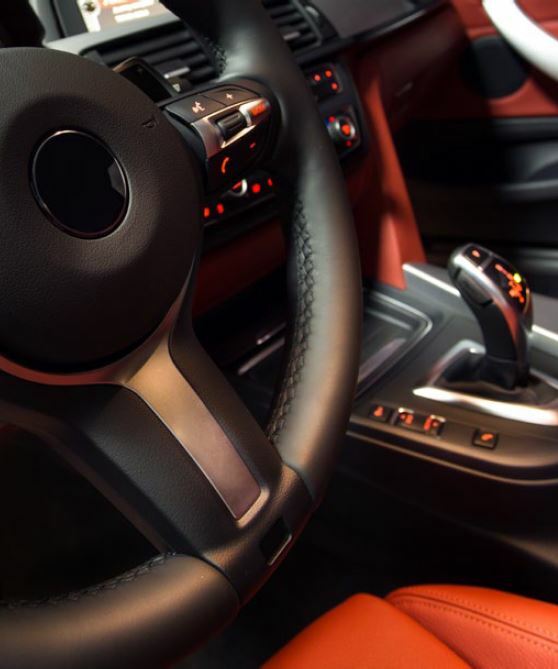 O-rings effectively seal many interfaces in an automobile. A lubricant is often applied to keep seals in place during assembly and allow them to assemble without damage. Choice of lubricant is critical: if the wrong lubricant is used for a given seal material, the seal could degrade, prematurely causing serious damage. Krytox lubricants are the preferred choice because they are compatible with all seal materials. Furthermore, Krytox lubricants do not contribute to seal degradation, because they do not oxidize, and they have greater temperature stability than the seals. The alternator is usually belt-driven by the engine and supplies electricity to basic automobile functions (headlights, radio, etc.) while recharging the car battery. As the electricity is being generated, the alternators, and hence the bearings, get very hot. Standard lubricants volatilize in the extreme high temperature environment of the alternator, leading to alternator bearing failure. As the bearings wear and begin to fail, they can increase the alternator’s resistance to rotation. This reduces the alternator’s performance and robs performance from the rest of the automobile. Perhaps more critically, if the alternator bearings fail, the alternator will fail and the vehicle will stop running. 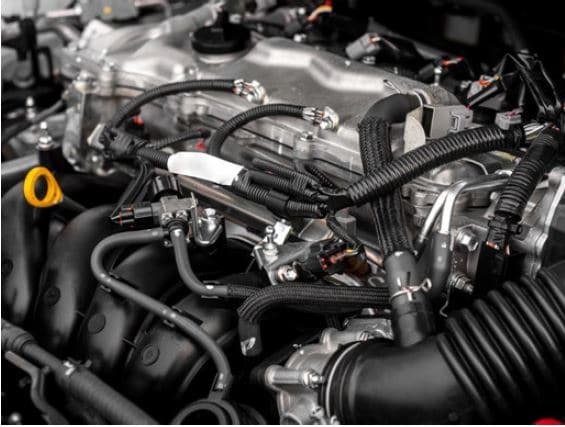 The higher output alternators used in today’s vehicles generate a tremendous amount of heat, demanding the advanced, reliable performance and heat stability of Krytox lubricants. The exhaust gas re-circulating (EGR) valve reduces nitrogen oxide (NOx) emissions formation by re-circulating some of the exhausted gas back into the engine cylinders. This lowers the peak temperatures inside the cylinder; thus, reducing the rate of NOx formation. If the valve does not open enough, insufficient re-circulation takes place and excess pollution is created. If, however, the valve sticks open, the temperature inside the cylinder can drop too much, decreasing engine performance and fuel mileage. Krytox lubricants are an ideal choice, as they withstand the high temperatures and exhaust fumes experienced by the EGR valve. The spark plug boot protects the spark plug from weather and prevents the unintentional grounding of the spark energy. the high temperatures and energies of the spark plug environment.